To respect the wishes of the deceased or his/her close relatives, the Association Française d'Information Funéraire offers the option of dispersing the ashes. This ceremony is performed with deference and allows the family to avoid travelling. 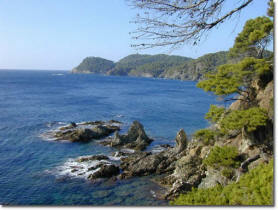 Natural regional park on the Mediterranean. These services are carried out on merchant marine registered vessels. They are performed under the supervision and with the guarantee of the Association. Upon the conclusion of the ceremony, a certificate is forwarded to the sender of the urn. Prices include taxes and may change without notice.